To support our wide range of LED products we offer simple to use remote colour LED controllers, dimmers and motion & light sensors for residential use right through to DMX controllers, data repeaters, 0-10V modules and decoders for the professional market. 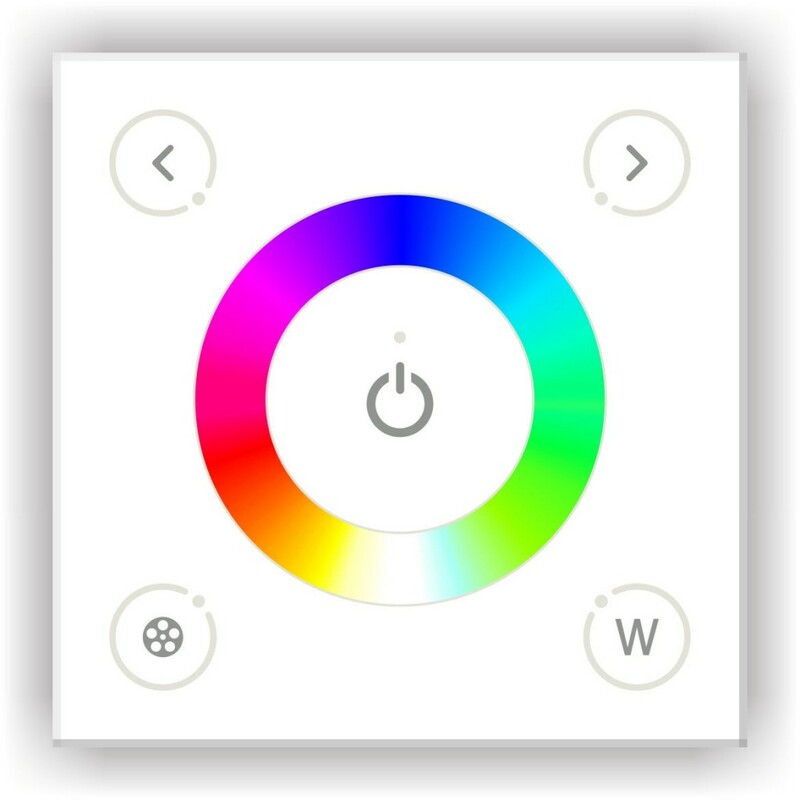 The RGB colour controllers can produce a staggering 16.7m different shades and by using the pause button you can hold the exact colour to match your requirements. 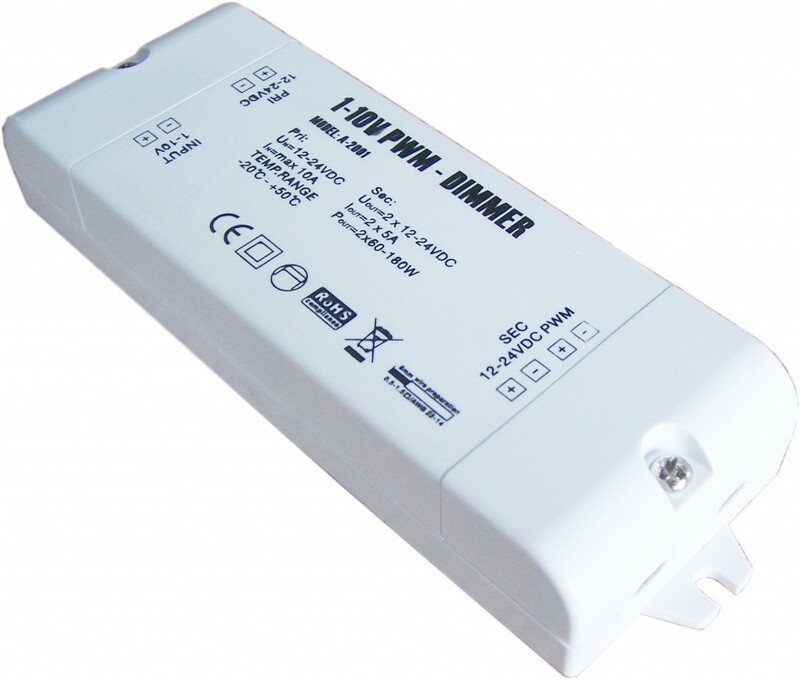 Dimming can be achieved by using a 1-10V module, PWM module or a wall mounted dimming switch. LEDs are known for their energy saving, this can be increased even further by using a Light & Motion sensor. Simple to wire in you can set the light level you require and the time the light remains on. If there is sufficient natural light the sensor will not operate. The stand-alone DMX controllers come with 30 pre-programmed channels which creates stunning effects whether in static, scrolling or jumping mode. If you have a large application the capacity of a controller can simply be increased by using a data repeater. This unit cannot be programmed independantly but follows the command of the master unit. If you already have a DMX desk in situ our RGB LED products can be controlled by this desk via our DMX decoders. The decoder receives the DMX address. Manual address is possible by dip switches. 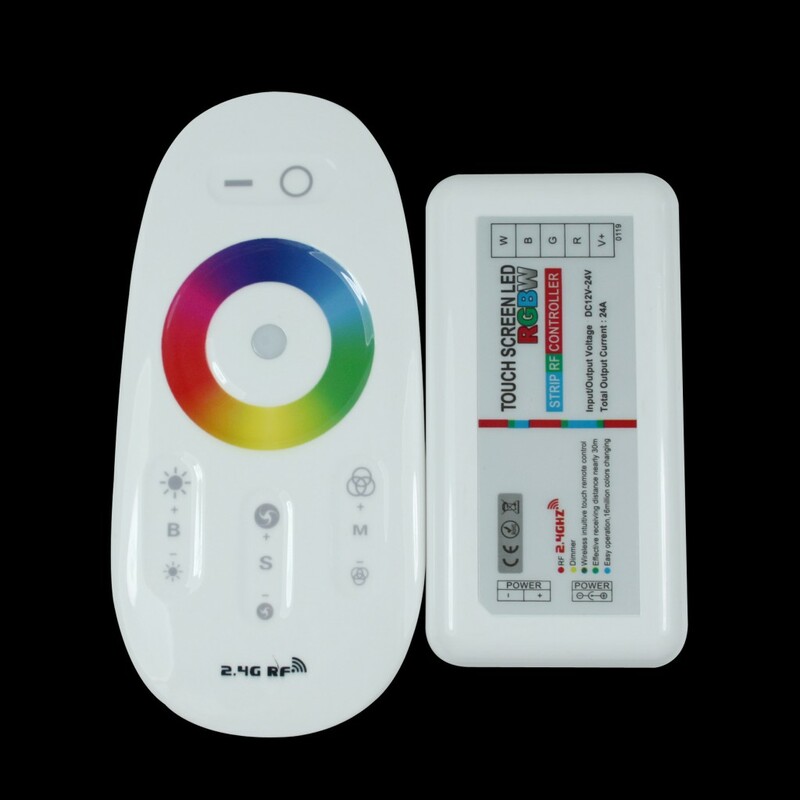 This COMPACT RGB+W LED touch RF remote controller is easy to use and ideal for residential use. A module is placed between the LED and transformer and operated by the tuneable remote controller. 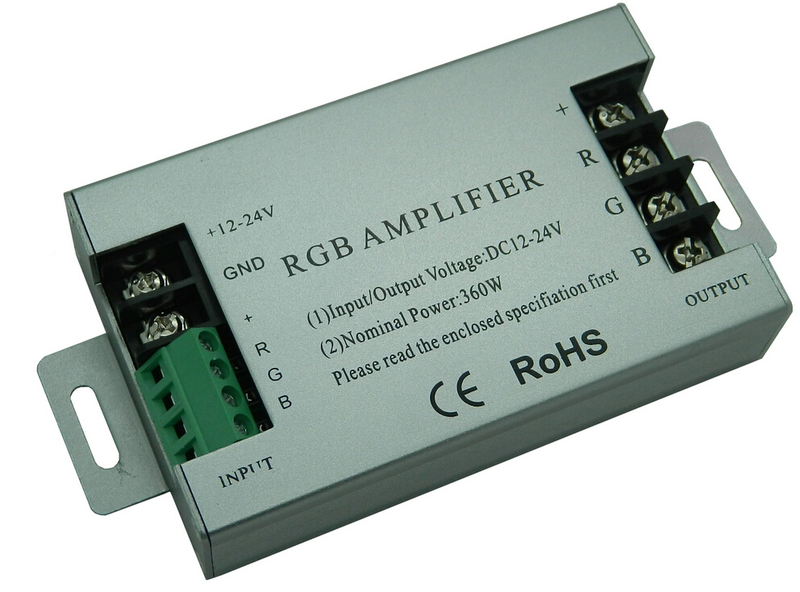 It will operate 12V & 24V products with a large capacity of 4 channels each 6 Amps. The remote has a range of 20-30m. 12 modes – static colour or white, gradule fade, jump, dimming and speed options. This controller remotely controls RGB LED Strip by Radio Frequency or by wire using DMX512 signal. Wireless or DMX control receivers are required, they are controlled together and remain perfectly synchronised with each other. The W button is for use with RGBW LED ribbon. Same size as a standard UK wall switch. Compatible with standard 35mm deep plastic back boxes, back box is not included. Metal back boxes shield the wireless signal so are not suitable. 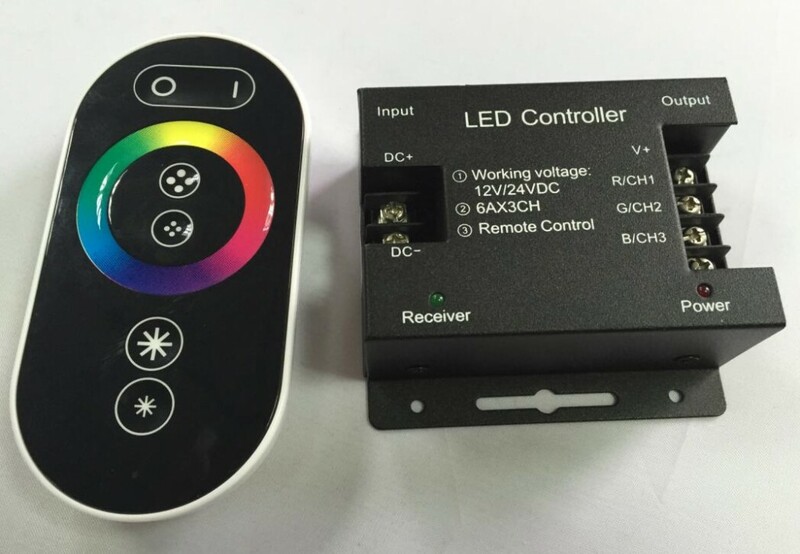 This high performance RGB RF wireless LED touch remote controller with a 30m range can control many metres of RGB LED ribbon in up to 8 zones using power repeaters. 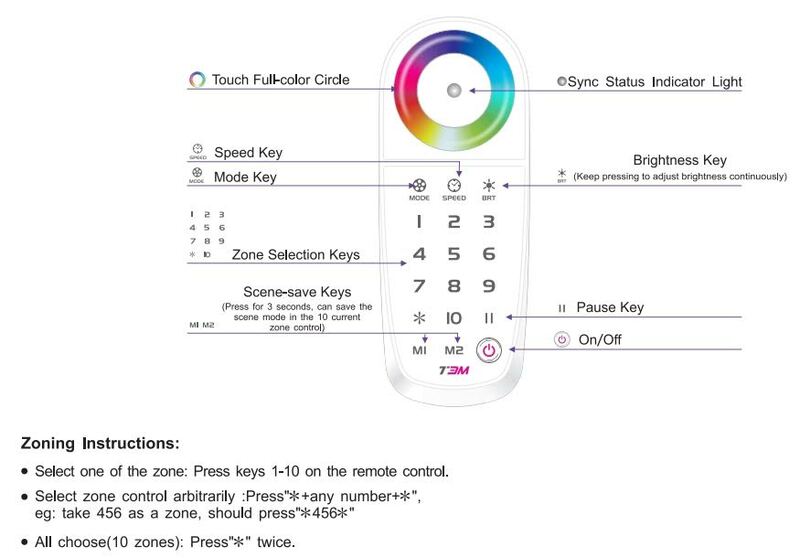 Simple to use and once the zones have been created it offers 18 modes including dimming & speed. 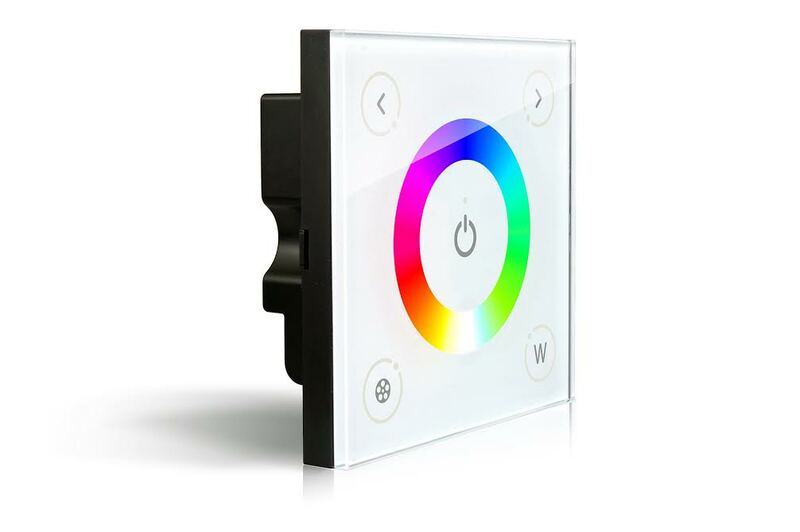 This high performance RGB+W wireless LED touch panel controller with a 30m range can control many metres of RGB+W LED ribbon in synchronised format using wireless receivers. This powerful RGB+W wireless wall plate controller with easy to use touch colour wheel can control in a synchronised or 4 zone format. The wall plate outputs a RF signal to wireless zone receivers. Features include an on/of button, touch sensitive colour wheel, colour scroll, jump and fade modes, dimming and speed adjustment. With 28 pre-programmed colour changing patterns it creates stunning effects whether in static, scrolling or jumping mode – robust and easy to use. This compact module is pre-programmed with 18 effects, the brightness can be controlled at each mode – ideal for residential applications. Single channel hand-held remote controlled dimmer which provides an easy way to dim LED lighting products – ideal for residential installations. This module will amplify the programme of the main controller – it cannot set its own scene. It has three channels each with a 10 Amp capacity. Multiples can run different LED products that operate on 12/24Vdc voltage. Only one transformer can run per controller or extension. 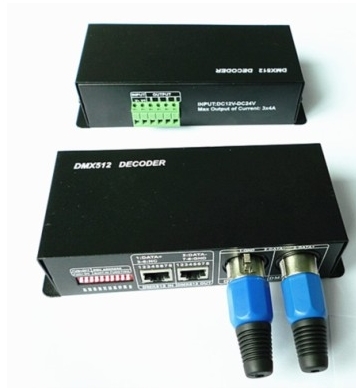 Used in conjunction with a DMX controller to read the DMX address and control the colour change and brightness of various RGB products. LEDs can be dimmed by this simple, compact, easy to use module. It smoothly dims using pulse width modulation (PWM).